NASA image created by Jesse Allen, using EO-1 ALI data provided courtesy of the NASA EO-1 Team, and Landsat data from the U.S. Geological Survey Global Visualization Viewer. Caption by Rebecca Lindsey. At least 350,000 people were affected by flooding in Namibia during the annual rainy season in southern Africa in March 2009. According to a report from the United Nations Office for the Coordination of Humanitarian Affairs, at least 92 people had been killed and 13,000 people were displaced as of April 1. 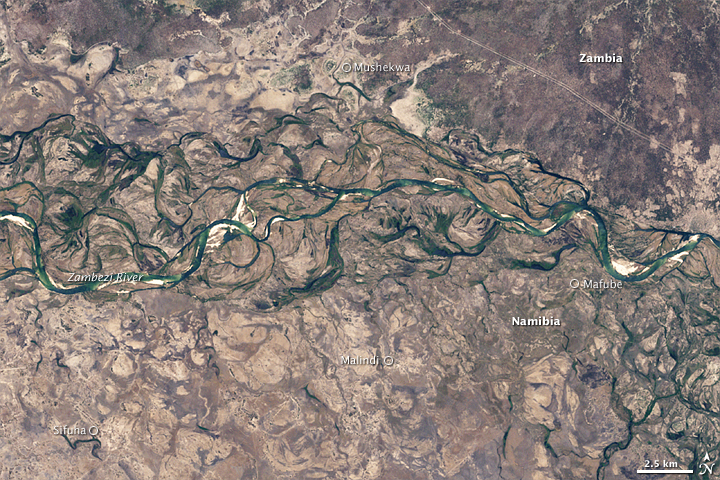 Among the places affected by the heaviest rains and most severe flooding was the Caprivi Strip, a narrow “peninsula” of Namibia that stretches out along the Zambezi River between Zambia to the north and Botswana to the south. This pair of natural-color images of the area was captured by the Advanced Land Imager sensor on NASA’s Earth Observing-1 (EO-1) satellite on March 28, 2009 (top), and the Landsat 5 satellite on October 18, 2002 (bottom). 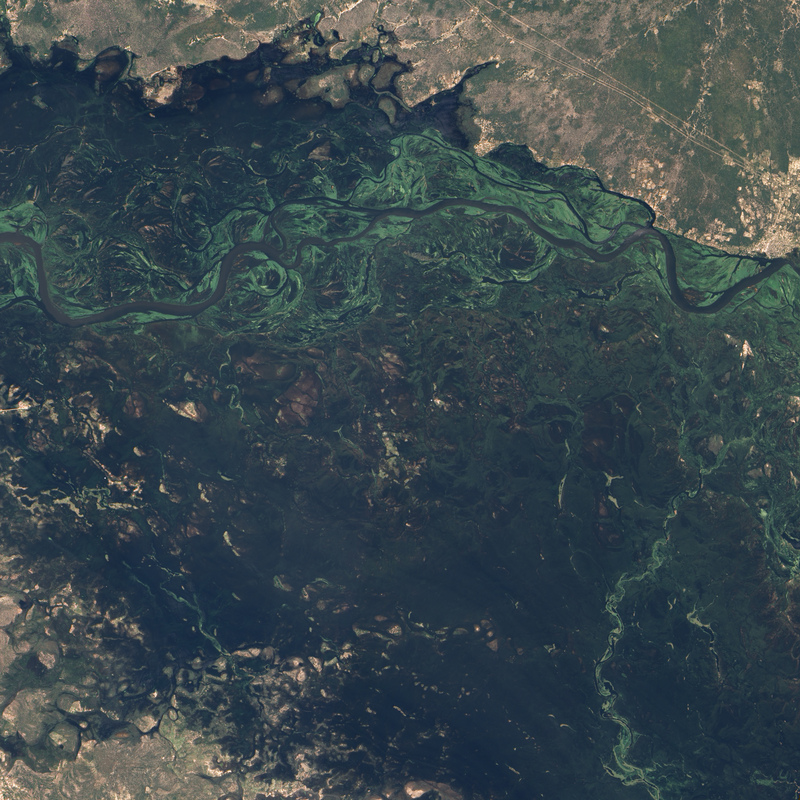 Flood waters pooled across a wide swath of the Zambezi flood plain on March 28, and numerous towns and villages were either underwater or surrounded by floods. 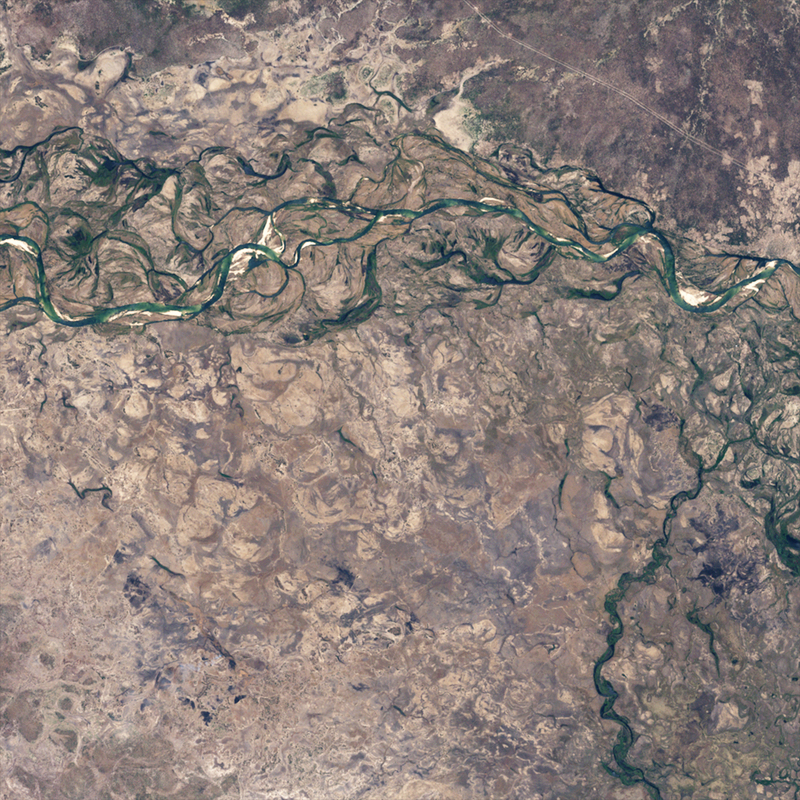 In the dry season, the river meanders in a narrow ribbon across the region. The vegetation is dry, and the land is shades of beige and brown. 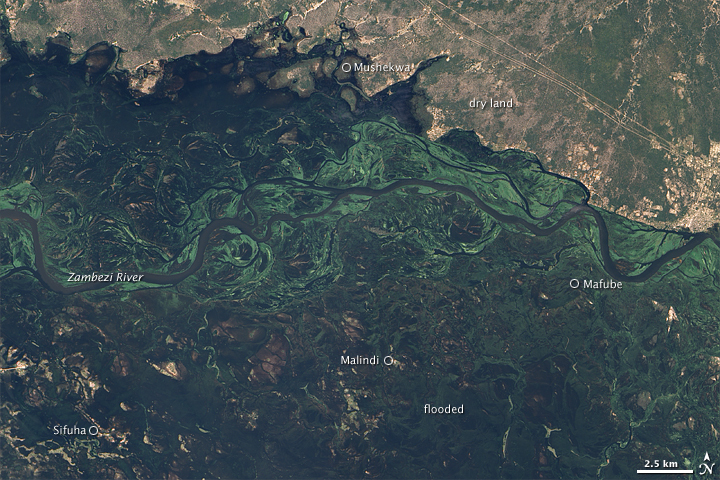 In the flooded image, the vegetation across the area is greener, which makes the flooded landscape look almost purple in places. Flooding during the southern Africa rainy season is a normal occurrence, but this year’s rains and flooding were exceptional. Quoting Caprivi Governor Leonard Mwilima, an Agence-France Press news report said that the Zambezi River rose to its highest level in 40 years. U.N. Office for Coordination of Humanitarian Affairs. (2009, April 1). Southern Africa: Floods and Cyclones Situation Report No. 2 (pdf). ReliefWeb Website. Accessed April 1, 2009.